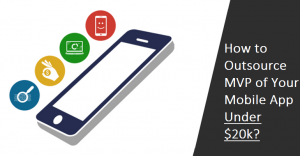 ﻿ How Mobile Education Apps Are Improving Education System in USA? From the last two decades, the influence of technology on education has been huge. Earlier, the education was associated with money, but gradually, the things have been changed. Today, communication centers, laptops, mobile phones, and tablets have been considered at one point or another as technologies promising with top educational apps for adults. However, smartphones stand apart from all these technologies. According to data compiled by the research firm Nielsen, approximately 58% of American children from 13- to 17-years-old owned a smartphone as of July 2012—an increase of more than 60 percent over the previous year. Moreover, in the United States, 98% of high school students have access to some kind of smartphone, according to a report by Blackboard and Project Tomorrow. Across the world, students are increasingly bringing their own smartphones, installed with best education apps, to the classroom to improve their access to information. With the number of mobile learning apps, it becomes a lot easier for students to understand the particular subject in more depth. According to the latest report, the education apps market size is to maintain the average annual growth rate of 6.25% from 2936 million $ in 2014 to 3522 million $ in 2017. It is expected that the education apps market size will be expanded further and by 2022, the market will reach $4579 million. Today, educational apps are considered as the most interactive and useful way to attract the students towards studies and improve their productivity. As apps have brought significant changes in the education industry, various institutions and individual educators are adopting mobile apps, allowing their students to get access to information from anywhere and anytime. Gone are the days when it was necessary for students to be present in the class because mobile education apps for students have made it easy for them to get access to information of different courses. Students can work on assignments remotely, check their courses, exam schedules, and get in touch with their teachers to discuss their problems and queries. There are many pupils, who can only get so much out of the traditional textbook and whiteboard method, and this is the reason why interactive apps are great for stimulating the mind. Today, education apps for Android and iPhone are available for all types of skill levels and aid learning using a variety of teaching methods like Q and A’s, video tutorials, etc. As we know that subjects are extensive and growing every single day, so there’s a huge amount of supporting material to any teacher’s curriculum. To keep students engaged in their studies, teaching methods must be fresh and innovative, so e-learning apps are considered as an excellent way of achieving this. Unlike school and institutes, education application system is available all the time, so students can access their desired m-learning apps without bothering about their schedules. They can study and learn anywhere and anytime whenever they feel comfortable. Moreover, students can also get in touch with their teachers and tutors in case if they have any query or confusion related to any subject. 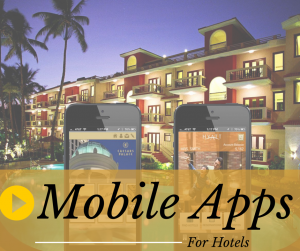 Along with helping students in studies, there are various education mobile apps that are mainly developed to keep students updated about information like campus events, timetables, alerts, and other important information. Even, some apps make it easy for students to pay their tuition fees, library payment, etc. through applications. So, this is how best educational apps are helping students in learning more easily and stay connected with their teachers. However, you might have a question in your mind that what are the top education apps that widely used by students, so let’s give a quick look at the best educational apps. Some of the students love math and they don’t need any type of assistance while solving a math problem. While others need some assistance when solving math problems. 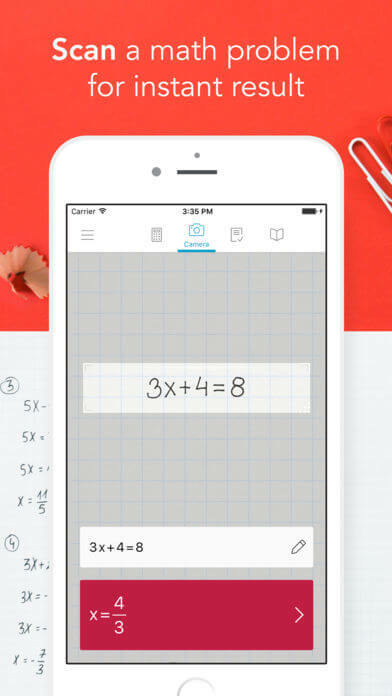 Photomath is the best homework app for math subject, allowing students to get an instant answer to their mathematics problems. According to the latest report from Crunchbase, “This Croatian app, Photomath has secured $6 million in Series A round of funding, led by Goodwater Capital.” Moreover, Photomath has surpassed 100 million downloads. Users just need to point the camera toward a math problem and it will display the answer with step-by-step instructions. The app can also help in drawing graphs. Students can make use of this app to practice so that they can learn how to do this. Moreover, it supports everything from basic arithmetic to advanced levels of math trigonometry. So, downloading this free and top education app can help students in many ways. 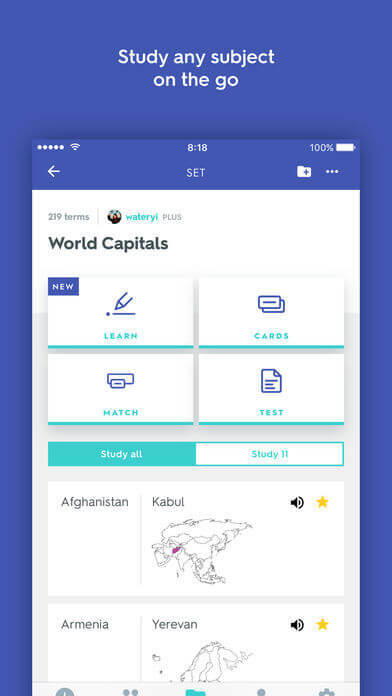 A lot of students are facing problem in creating their study sets of different subjects, so Quizlet is the easiest way to create your own flashcards and study sets or students can choose from millions of study sets that are already created by other students. There are more than 20 million students, who are studying for free of cost with Quizlet every month. The app can also help you to see what you are learning in a completely new way with diagrams. So, study charts, maps, images and figures with learn and match. Discover different diagrams on Quizlet and look for the perfect one for you. 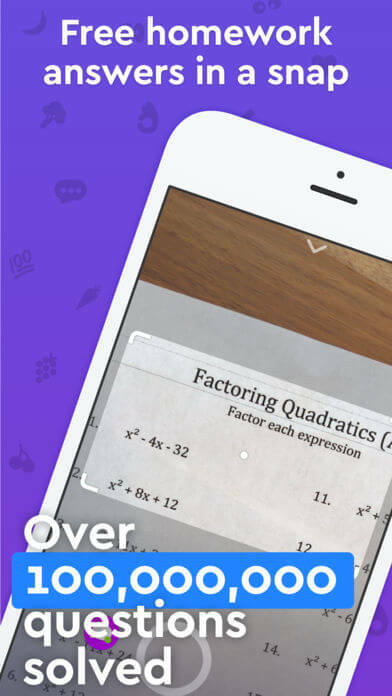 Socratic is the widely used math problem-solving app that helps students to get instant answers to their math problems. Along with math, this homework planner app supports some of the other subjects, including English, Economics, Science, History, etc. 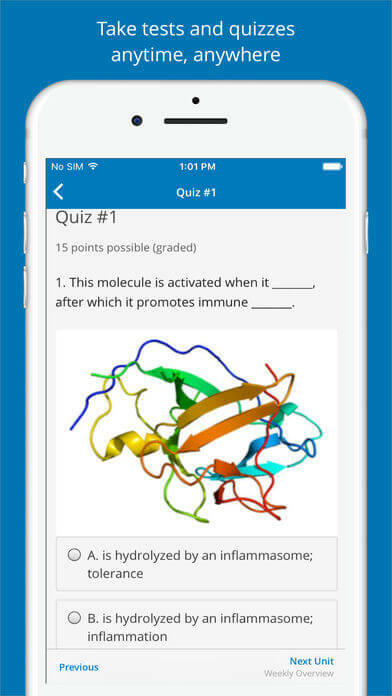 Makes use of artificial intelligence, this education app will help all the students to get answers and detailed explanations to clarify the concept. In addition to this, the developed considering the high school curriculum, so it is equipped with graphs and explainers. One of the best features of this learning mobile app is that it curates web video from Khan Academy and other educational platforms. 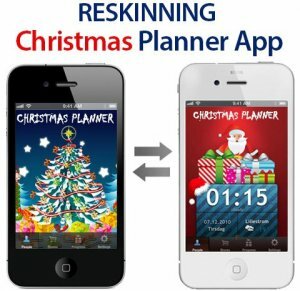 So, this is one of the best learning apps for Android and iPhone students that can be downloaded for free of cost. Edx is one of the top educational apps that are obtainable for free to download for students. Allow students to get online courses from the world’s top universities and institutions. Using this education mobile app, students can learn from the experts at Harvard University, Tsinghua University, Microsoft, MIT, UC Berkeley, The Smithsonian and more. Equipped with enormous features like tests, online lectures, quizzes, personal schedule, etc. the application allows students to earn a certificate if they study hard enough. It is a must downloading education app that stream class videos through Wi-Fi and cellular connection. These top education apps are widely used by students worldwide, and the popularity and need for such education apps and tools are increasing constantly as it can help students in many ways to achieve their goals. 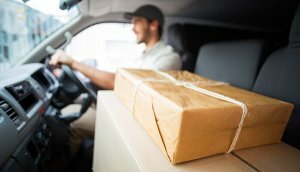 How Can You Contribute to the Education Industry? Today, education-minded entrepreneurs and organizations are highly focused on launching the next wave of inventions that can change the way students learn. Even investors are also motivated to support such initiatives and you can check out how investors invested $1.25 billion in tech education start-ups in 2013 alone. 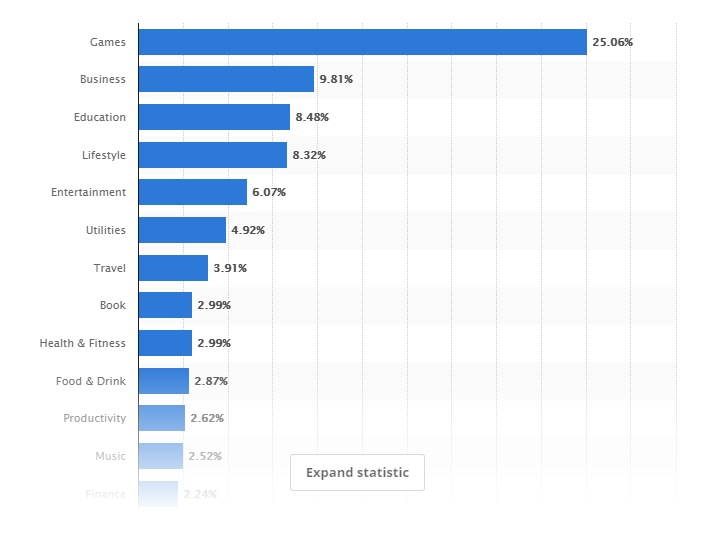 According to the latest statistic report, the most popular category in the Apple App Store is education that ranked no. 3 with 8.48% share. As of June 2017, more than 180 billion apps were downloaded from the App Store. So, if you also wanted to contribute to the education industry and help students learn in an easy way, you can have your own education app or invest in developing educational apps. Being an educational startup, if you have any education app development idea or learning app development idea in your mind that you think can help students, you can discuss it with us as we are a leading iPhone app development company based in India and specialized in developing applications for education. This page was last edited on March 19th, 2019, at 1:27. No mention of Project Gutenberg. Free books do not contribute to “industry” even if they do educate.